From a distance, the grey cement bridge looks unremarkable. Two tunnels on either side of the Trans-Canada Highway arc in semi-circles that end bluntly on the pavement below. But on top, away from passing motorists’ eyes, lies a grassy oasis. Against the odds, pine trees and wildflowers have taken root here, giving the overpass a fringe of greenery. On the edges, wire fencing provides safe passage for roaming animals. “These overpasses have been really, really effective for wildlife,” says Parks Canada human-wildlife conflict specialist Steve Michel as he drives down the portion of highway that bisects Banff National Park. 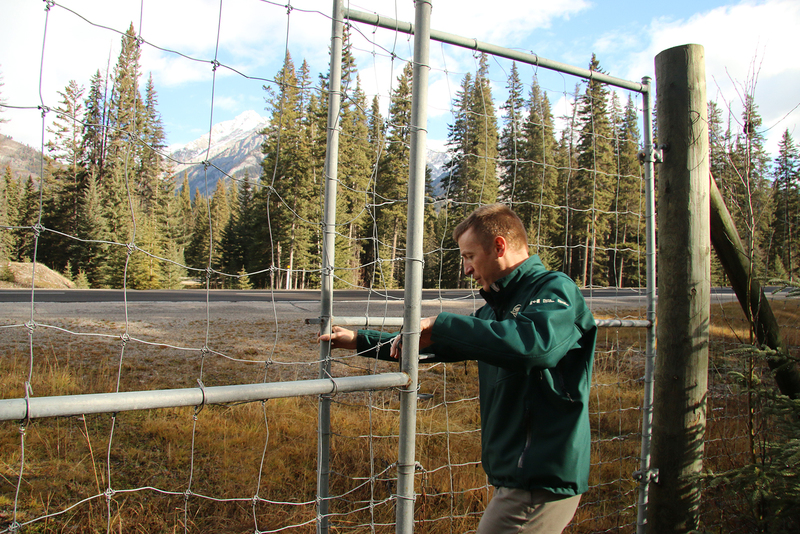 Thirty kilometres west of the Banff townsite, he pulls over alongside another fence that runs all the way to the British Columbia border. Since the 1980s, the Canadian government has allotted more than $400 million to upgrade and twin the four-lane highway, with a quarter of the budget set aside for projects that would reduce wildlife collisions, a growing concern. Parks Canada decided they would use part of that money to fence the entire highway — roughly 180 kilometres — and construct several dozen wildlife crossing structures in hopes of lowering the mortality rate. Michel opens a padlocked gate set into the fence and descends a steep, soggy embankment toward what looks like a drainage culvert along Redearth Creek. Signs warn us in bold typeface to keep out. At the bottom, the culvert reveals itself to be one of the park’s camouflaged wildlife underpasses. Black bears and mountain lions prefer to use these shadowy, damp tunnels, says Michel, whereas grizzlies and ungulates prefer the open sightlines offered by the overpasses. In November, Parks Canada marked the 20th anniversary of the completion of the first wildlife overpass in Banff National Park. Though many biologists and citizens were skeptical of the wildlife bridges when they were first built, the six overpasses and 38 underpasses that criss-cross the Trans-Canada are today considered a worldwide conservation success story, reducing wildlife collisions by 80 per cent and buoying Banff biologists to rock-star status in the realm of transportation ecology. Delegations from around the world now visit Banff to learn more about their crossing structures in hopes of building similar systems in their home countries, where new roads are cutting through wilderness areas at unprecedented rates. Few national parks have to deal with major national highways and railroad corridors slicing through them. Tony Clevenger has dedicated much of his life to studying the performance of Banff’s wildlife crossing structures. When the first wildlife bridges went up, Clevenger, a researcher with the Western Transportation Institute, was living in Canmore, and recalls the distinctly negative atmosphere that surrounded what many saw as a hair-brained scheme by Parks Canada. Save for a few small crossings in the eastern United States, no one had ever attempted something like this before — and no one believed it would work. Editorials in the local paper scoffed at the “waste of taxpayers’ money” and confidently stated animals would never use the $2 million to $3 million man-made bridges. Others believed wolves would herd their prey into the fence, violently killing them before traumatized tourists. Clevenger now has 17 years-worth of data proving the efficacy of the crossings. Among large carnivores, mortality rates are 50 to 100 per cent lower along sections of the highway where overpasses and underpasses exist. In those same sections, mortality rates for elk are almost zero, compared to 100 elk-vehicle collisions per year in the mid-1990s. Clevenger’s research has shown that 11 species of large mammals in Banff have used the structures more than 200,000 times, including unexpected species such as red fox, hoary marmot, boreal toads, wolverines, lynx, garter snakes and beavers. In 2014, a Montana State University study found that not only are grizzly bears using the crossing structures, but the structures are also helping to maintain genetically healthy populations among the bears that use them. Grizzlies were crossing with enough frequency to ensure populations on either side of the highway weren’t genetically isolated from each other. Roads don’t only imperil wildlife through vehicle collisions; they can fragment habitat and cut off critical migration routes for species. It’s estimated that 25 million kilometres of new road will be built by 2050, the majority in developing countries who have never before had to confront the impact of highways on biodiversity. “Many of those roads are going into globally significant biodiversity hotspots, and they don’t know how to manage those different taxa,” says Rob Ament, a road ecologist at Montana State University’s Western Transportation Institute and member of the International Union for Conservation of Nature’s International Connectivity Conservation Network specialist group. Scientists have come from around the world to learn how to adapt and implement similar crossings in their own countries over the past two decades. In the 2000s, Salish and Kootenai tribal delegations from Montana visited Banff to learn how grizzlies used the overpasses and how to build their own on the Flathead Reservation. Then came biologists from Washington’s Cascade Range, who wished to pursue a similar project over the I-90. But in recent years, delegations and requests for consultations have been coming from farther and farther away — Mongolia, Argentina, China. In Mongolia, the government recently approved new policy standards that require developers to provide passage for wild animals along auto and railroads in the eastern steppe and the Gobi Desert, where mining is booming. “They don’t have any highways — they’re building their first highway as we speak,” says Ament, adding that they’re simultaneously working on the design for their first wildlife crossing in the Gobi Desert to protect goitered gazelle, black-tailed gazelle and argali bighorn sheep. Among large carnivores, mortality rates are 50 to 100 per cent lower along sections of the highway where overpasses and underpasses exist. In those same sections, mortality rates for elk are almost zero. At the same time, however, Banff is being beaten at its own game. While wildlife mortalities on the Trans-Canada have fallen dramatically, more and more animals are meeting their end on the stretch of Canadian Pacific Railway that cuts through the park. In 2010, Parks Canada joined forces with CP Rail on a $1 million, five-year joint study to figure out why animals, mainly grizzlies, were dying on the railroad in unprecedented numbers. Their research revealed that a number of factors were drawing animals into the rail corridor, from increased vegetation to an inability to detect oncoming trains, with bears often running toward them, instead of away. Researchers concluded there was no single silver bullet that would fix the rail problem, although it could be feasible to implement overpasses in certain spots. Because the railroad in Canada is privately owned, however, wildlife managers aren’t able to implement crossing structures over the tracks as easily as they might in other nations where governments rule the rail. Already, China has constructed 33 wildlife passages over and under the Qinghai-Tibet Railway to help Tibetan antelope during their migration. “When you’ve got private, linear land going through the park, the rail company can do whatever they want,” says Clevenger. “The bottom line isn’t trying to balance ecological integrity, it’s big profits.” And railway overpasses are expensive. The problems Banff faces are unique at a global level. Few national parks have to deal with major national highways and railroad corridors slicing through them, transporting tens of thousands of cars and trucks, and dozens of trains, each day. But the fact that the efficacy of the crossings has been proven in one of the most challenging environments possible should make similar conservation efforts elsewhere easier. Banff’s achievements in the realm of transportation ecology over the past two decades have paved the way for other nations to follow suit, providing a literal road map of how best to protect vulnerable wildlife in areas of rapid infrastructure development. Gloria Dickie (@GloriaDickie) is a Victoria-based science and environmental journalist specializing in biodiversity conservation, climate change, ecosystem and land management, and environmental law and policy. She has written for publications such as National Geographic News, Outside, Discover, VICE, Hakai Magazine, Quartz, Audubon and Arctic Deeply.